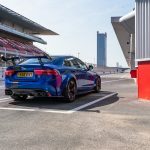 The world’s fastest four-door sedan, the Jaguar XE SV Project 8 added a new lap record to its growing list of global achievements. 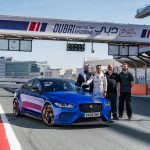 The stock, standard Jaguar Project 8 lapped the 5.39km Dubai Autodrome GP circuit in 2:18.81 mins, making it the fastest four seater, four door sedan around the circuit. 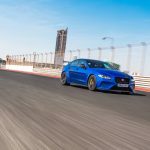 The Jaguar XE SV Project 8 is the most extreme Jaguar saloon ever produced. Based on the award-winning Jaguar XE, the SV Project 8 is the most track-ready version designed, engineered and hand-assembled by Jaguar’s Special Vehicle Operations. To preserve the exclusivity and collectability of the most powerful and agile Jaguar road car ever, the brand will build and sell no more than 300 examples worldwide. 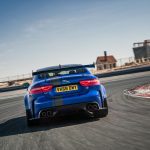 The Project 8 has already claimed two previous records at the challenging 20.8km Nürburgring Nordschleife in Germany in November 2017, followed by California’s Laguna Seca Raceway in September last year. The new lap record was accomplished by Jaguar Land Rover Test Driver & Engineering support, Xavi Barrio Duato. Xavi brings with him a wealth of driving experience gathered in Spain and China over decades. Its mix of explosive power, dynamic agility and all-wheel drive traction is the result of significant SV enhancements that include lightweight aluminium and carbon fibre exterior panels combined with a 441kW, 5.0-litre supercharged V8 engine. The result is supercar performance from Jaguar’s most compact four-door sedan, touching 320km/h and reaching 100km/h in just 3.7 seconds. 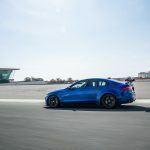 Limited in production, the Jaguar XE SV Project 8 is the first car completely hand-assembled by Special Vehicle Operations’ expert craftsmen at the new SV Technical Centre in Warwickshire, UK. All Project 8s are built in left-hand drive configuration only.